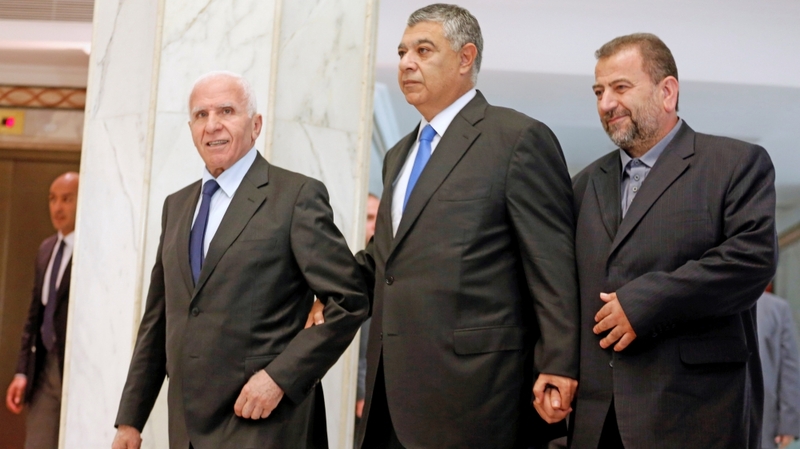 On Saturday, a Palestinian Authority (PA) delegation departed for Egypt to discuss reconciliation with Hamas and the ongoing negotiations with Israel for de-escalation in Gaza. This visit comes after weeks of tensions between Ramallah and Cairo, marking the lowest point in relations between the two in recent years. Reports have been circulating that Palestinian President Mahmoud Abbas has become increasingly angered by the Egyptian government, fearing its alleged role in the “deal of the century” and its disregard for Ramallah’s interests in Gaza. Egypt has been given the green light by the United States and Israel to lead efforts to reconcile Fatah and Hamas and form a unity government meant to usher the PA back into power in the Gaza Strip. It has also been mediating in de-escalation negotiations between Israel and Hamas, which Fatah views with suspicion. But given the increasing hostility and intransigence in relations between the two main Palestinian factions, it paradoxically appears that the Palestinians are more ready to conclude a truce with the Israelis than reconcile with each other. Last month marked the 11th anniversary of the political division between Gaza and the West Bank. In 2006, Hamas won the elections in Gaza, which Fatah refused to recognise. After clashes erupted between the two, Fatah supporters were expelled and Israel imposed its siege in Gaza in 2007. Since then, there have been numerous attempts to broker a deal – by Egypt, Qatar, Saudi Arabia, and Yemen. Despite the signing of a number of agreements by Fatah and Hamas, the latest of which was in Cairo in 2017, effective reconciliation has not been reached and the political feud continues. In late July, Egypt set up a reconciliation programme which outlined the steps the two political powers would have to take in order to complete the process. Hamas approved it, but Fatah recently announced that it would not abide by it. Instead, Abbas came out with a set of tougher demands, including Hamas’ complete surrender of Gaza. Ramallah now wants to regain full political, security and military control over the strip in exchange for reconciliation – a demand that Hamas will not heed. Despite the involvement of various local and regional players in the dispute between Fatah and Hamas, it doesn’t seem that there is any progress towards dissuading Abbas from his decision to pursue this rigid position. His intransigence has contributed to the unusual low in his relations with Egypt. In fact, Ramallah has only intensified its pressure on Hamas. In the past few months, the PA took a number of punitive measures against Gaza, including arbitrary cuts to salaries of state employees and a serious decrease in the operational budget of the Strip. This has pushed Gaza to the verge of collapse, which was the intended effect of these measures. Abbas hopes that when pushed to the brink, the Palestinians of Gaza will rebel against Hamas and take down its government. Given that the reconciliation process along the lines Egypt is proposing has been approved by Washington, one could wonder why Abu Mazen is rejecting it so categorically and where he gets the courage to do so. In mid-August, the Palestinian president went as far as refusing to meet the head of Egyptian intelligence who was on a visit to Israel and was supposed to meet with PA representatives. Perhaps the answer to this question can be found in Israel’s recent announcement that the intelligence arm of the PA has uncovered a plot to attack an Israeli military patrol in the West Bank. Abbas clearly feels confident that as long as Israel depends on him for security cooperation in the West Bank, he has enough freedom to manoeuvre and reject deals he fears could sideline or hurt his power. And while reconciliation efforts are failing, there is significant progress being made towards de-escalation between Hamas and Israel through the mediation of Egypt, Qatar and the UN. Advances have been made in that direction despite the absence and even opposition of the PA.
All sides in these talks consider the de-escalation a much-needed move to preclude other much more dangerous developments. From one side, Hamas is trying to avoid any escalation which could prove much more deadly than any previous wars with Israel and could completely wipe out its military capabilities. More importantly, it could lead to the collapse of its power over Gaza, precipitating a period of political chaos or even the PA rolling into the Strip on top of Israeli tanks. This would mean the loss of the last Hamas stronghold (after the movement was uprooted by the PA and Israel from the West Bank) and potentially the loss of its status as a major player on the Palestinian political scene. That is why Hamas is trying hard to avoid another major war with Israel and will never accept the terms Abbas is currently offering for reconciliation. On the other hand, Israel too realises that a possible war with Hamas poses a high security, economic and political risk. Hamas has missile capabilities which might not be able to cause vast destruction but danger of a mass missile attack would surely paralyse Israel’s major cities. The last war also demonstrated that the fighters of Gaza-based armed groups are capable of infiltrating and striking deep into enemy territory. For Israel, this would mean heavy economic losses and dozens of soldiers and civilians killed and injured, which is a huge political risk for the government. At the same time, there is also the risk that Israel would fail to wipe out Hamas from the Strip and would face the very same uneasy stalemate in Gaza that it currently is in. Also, both sides know full well that a fourth major war would decimate Gaza and result in an unimaginable humanitarian disaster. The vast destruction inflicted by the previous wars still debilitates life in the Strip and the international community has not had the chance to conduct any meaningful reconstruction. Despite the obvious need for a de-escalation, there are still major barriers to the conclusion of a deal. One of the biggest challenges is the lack of agreement between the two sides on what this deal should entail. Hamas wants major steps made to alleviate the humanitarian situation in Gaza – such that the Palestinians living there would feel a difference in their lives. Israel, on the other hand, doesn’t want to allow that and instead hopes to get a deal in exchange for a modest amount of humanitarian aid. There are also various opponents to the idea of a de-escalation, both among the Palestinians in Gaza and the Israelis. Within the Israeli government, for example, Prime Minister Benjamin Netanyahu is clashing with Defence Minister Avigdor Lieberman, who rejects any engagement with Hamas, arguing that it would give the armed group time to regroup, rearm and be better prepared for another war. It is also expected that the PA will not stand by idly if a de-escalation deal is reached. Reports have been circulating in Israeli media recently that Tel Aviv is preparing for the possibility of Abbas announcing another set of escalation measures against Gaza, which could provoke Hamas. Such a move would aim to ensure that whatever relief comes through as a result of a de-escalation deal does not make a real difference on the ground and Gaza continues to face a humanitarian disaster and potential political instability. Hamas has been trying to negotiate guarantees as part of the deal that it would be compensated for whatever additional financial cuts the PA decides to impose. This, however, would be difficult to achieve because it would contradict Israel’s strategy of allowing the bare minimum to trickle into Gaza and to keep the Palestinians there “neither dead nor alive”. In the coming weeks, it is likely that we’ll see more efforts to thwart the de-escalation deal which will make Gaza the scene of more intense military and political developments. But, regardless of what happens, there seems to be a much better prospect for the conclusion of a de-escalation deal than reconciliation between Fatah and Hamas.